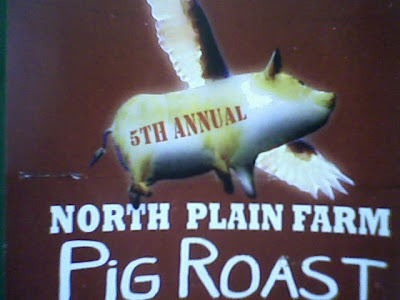 The Stanton Brothers’ annual end-of-summer local food extravaganza will take place on Saturday, September 6, 4pm to 8pm at their North Plain Farm (205 North Plain Road in Great Barrington). Last year I drove past while the party was underway and it looked like a really good time. I hope to attend the festivities this year. On the menu: heritage breed roast pig, pasture-raised roast chicken, grass-fed veal calf (described on the invitation as “Yum! !”), Taft Farm sweet corn (which I can attest firsthand to being delicious), vegetables galore from Farm Girl Farm (where I haven’t been, but my friend Hope subscribes to their CSA and I’ve told her to tell them that I’d buy a Farm Girl Farm t-shirt in a heartbeat if they had one and I’m sure I’m not the only person who would), local cheeses, local beer, local hard cider. $30 adults until August 31 ($35 thereafter) and kids 16 and under pay their age. It’s BYOP (Bring Your Own Plate) ’cause they’re saving the planet. Be there. For information and tickets, call Sean Stanton at 413-528-2092.